Robert A. Boyd is a fellow member of the Northwest Writers Association, and if you like your science fiction from non-human points of view, you may well want to check him out. Though for reasons that will be obvious to anyone who’s read Faerie Blood, I did snerk at the mention of Elvis Worshippers! I am so delighted to speak again with all my dear friends there on earth, especially now that the Contact Crisis seems to be winding down, and relations are improving between d’enchia and earth. Those were some troubling times; times when war seemed all too likely, and distrust and paranoia were rampant on both sides. I don’t think any of us realized before then how traumatic First Contact could be! Thankfully the Arbiters were able to work through the tensions and forge the beginnings of a lasting peace between our two worlds. The diplomatic effort (which I had a small part in) was fraught with problems, personal conflicts, political tensions, and—it must be said—the gyrations of some of your less stable folks such as the Anti-techs and the Elvis Worshippers. Yet through it all, through the misunderstandings and shortages and broken water mains, we managed to limp on. Our tails dragged at times, surely, but we came through. I’m sure the Arbiters won’t approve (K’deiTai can be such a spoil-sport at times! ), but I want to make an appeal to all you good folks there in the Alliance Of Nations. Diplomacy is a herd effort, and so much goes on in the background which the public never sees, but which can shape the destiny of whole civilizations. Fortunately, now that the crisis is passing, the story is starting to come out in a trilogy of recently published books, translated to human language, which tell the real saga of what went on behind the scenes; although that ‘muck-raking expose’ cheap shot is terribly unfair. Hey, I’m not perfect. We all have our awkward moments, don’t we? And it doesn’t help that the cultural differences between our two races can be so confusing at times. Why make such a fuss over that fire at the Defense Ministry, I ask you? 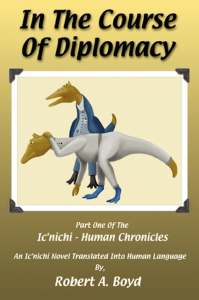 And why all the fuss over that little misunderstanding which almost led to the embassy being evacuated, or the time I blackmailed the Chancellor…but I suppose I shouldn’t talk about that even now. The point is, even if I am impulsive and hot-tempered (as some unkind souls would tell you) I have the best intentions in all the Universe. And a lot of what happened wasn’t my fault. Can I be blamed for the entire fleet being put out of commission when I went into labor? I mean, really! No matter. 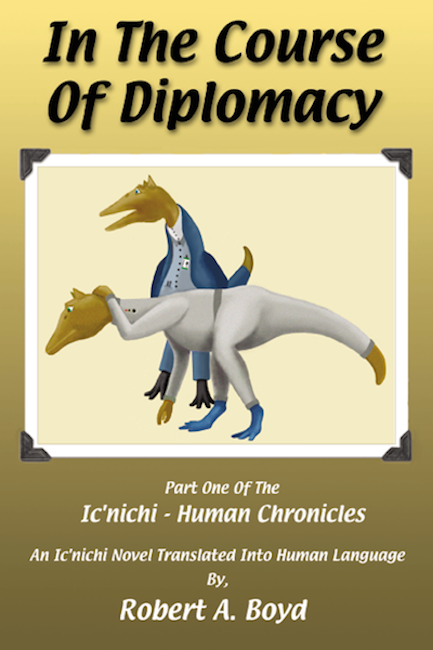 What I’m trying to say is that the real story of our diplomatic effort with you humans remains largely untold, and this new trilogy will go a long way to improving understanding all around, and thus improving relations between d’enchia and earth. I hope all you good people who cherish peaceful interstellar relations will look into them. Thank you all for your time and interest. Well, I have to go now. I’eiBida will be home soon, and I just know he’ll be upset when I tell him about my latest misadventure!